In a large skillet sauté 2 Tablespoons vegetable oil, 3 Tablespoons butter and 1/2 cup of chopped green onions until tender. Add 2 pounds of shelled chestnuts, 4 cups chicken stalk and a dash of seasoned salt and seasoned pepper. Cover and simmer about 25 minutes or until liquid is absorbed and chestnuts are tender. Puree the chestnuts in a ricer or food processor. This type of chestnut recipe is often served in Europe, Asia and Africa in place of a potato side dish. 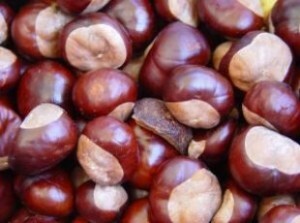 Chestnuts are often eaten raw, roasted or in recipes. And the interesting, but slightly useless, trivia for the day is that they are said to be one of the first foods consumed by man. They are low in fat and an ideal source of trace minerals and vitamin c. In fact, chesnuts are comparable to brown rice in nutrients. This is so cool. I loved the interesting little fact. I’m excited about the free Jif sample. Would you recommend using it with the chestnut recipe?